Trout streams are continually degraded by human and natural events. 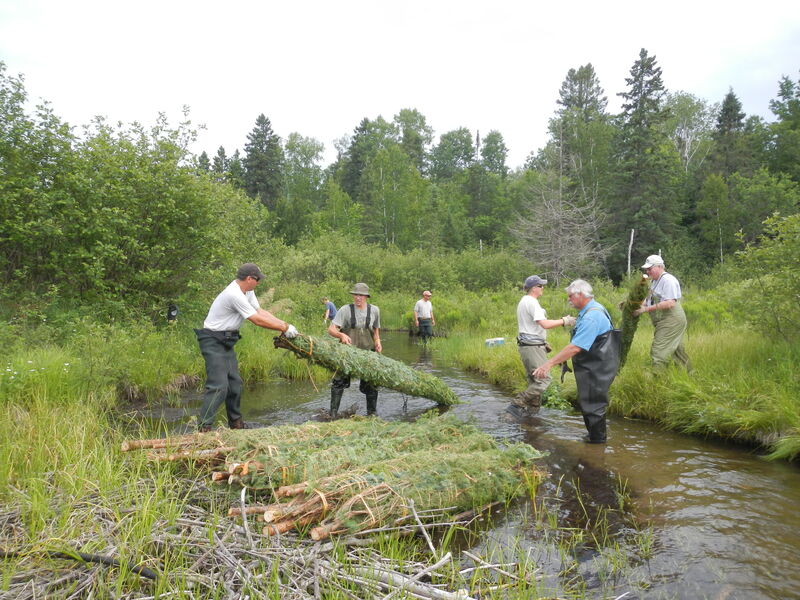 We work to optimize trout habitats by improving stream and watershed conditions. 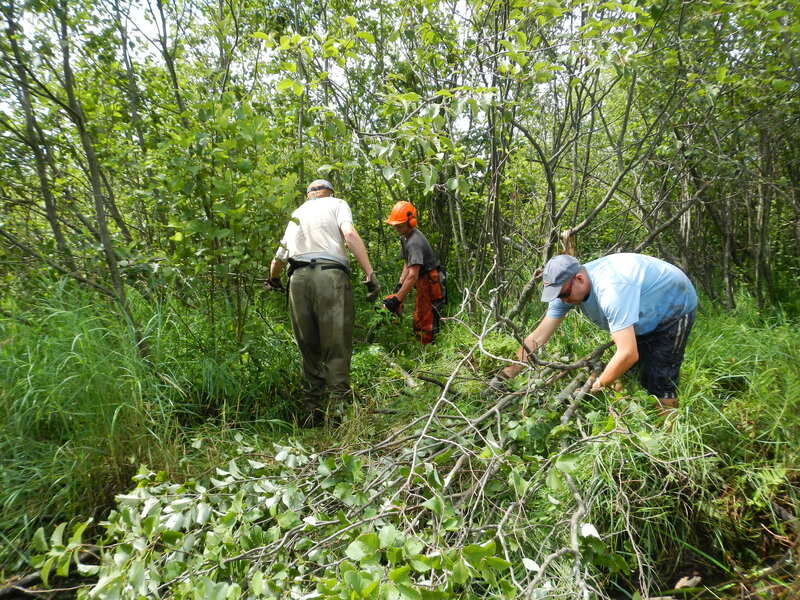 If you’re not afraid to roll up your sleeves and participate in some outdoor activity, we’d love the extra power! 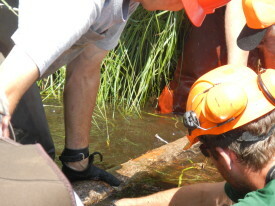 Some of the methods we utilize are illustrated below in the Techniques section. 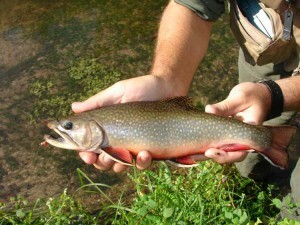 Please click on this Brook Trout ( Salvelinus fontinalis ) link to learn more about our fish friends. Completed projects are testimony to GBTU’s ability to provide effective solutions that mesh seamlessly into natural, trout environments. 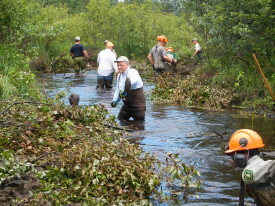 Work projects are held on the third Saturday during the summer months, accomplishing physical stream improvements and getting to know other chapter members. 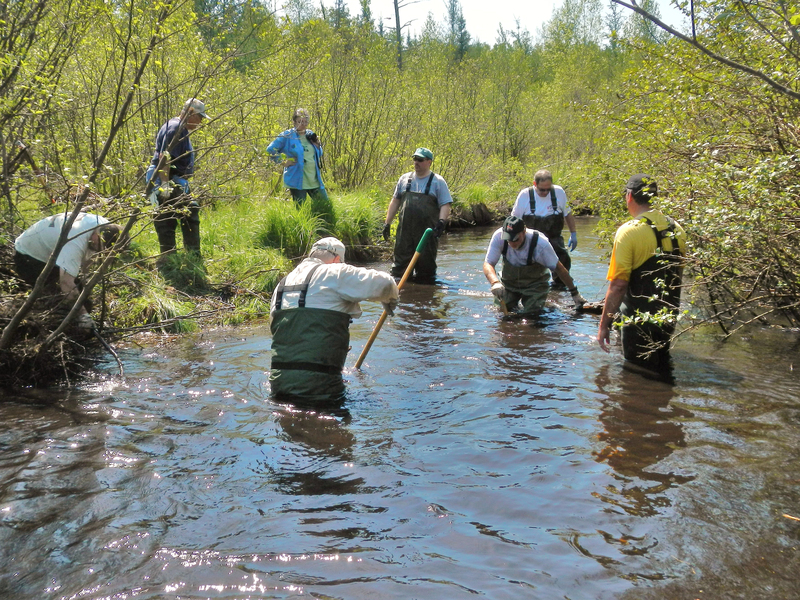 Dr. Robert L. Hunt’s book “Trout Stream Therapy” is the resource for learning about trout stream habitat improvement. 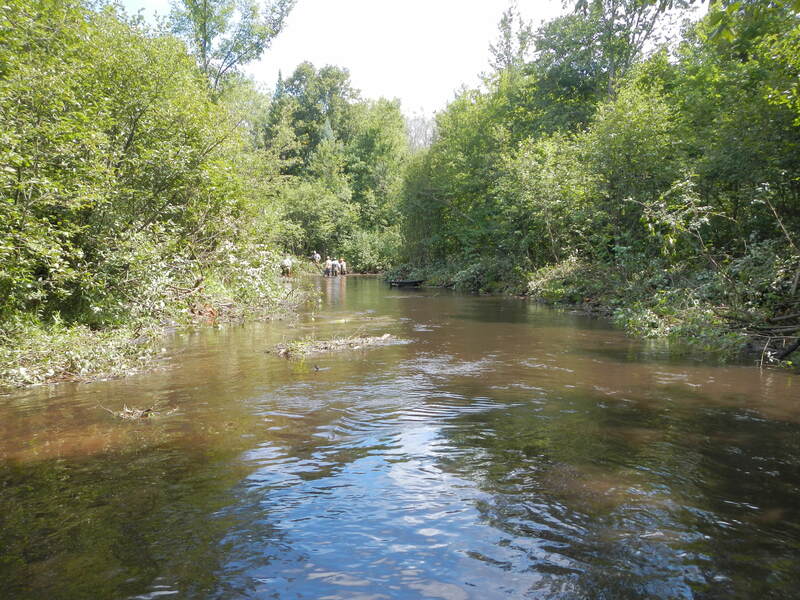 The text, pictures and color illustrations are excellent. 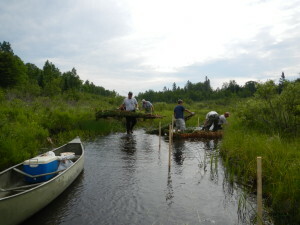 Visit our Galleries for pictures of our work projects. 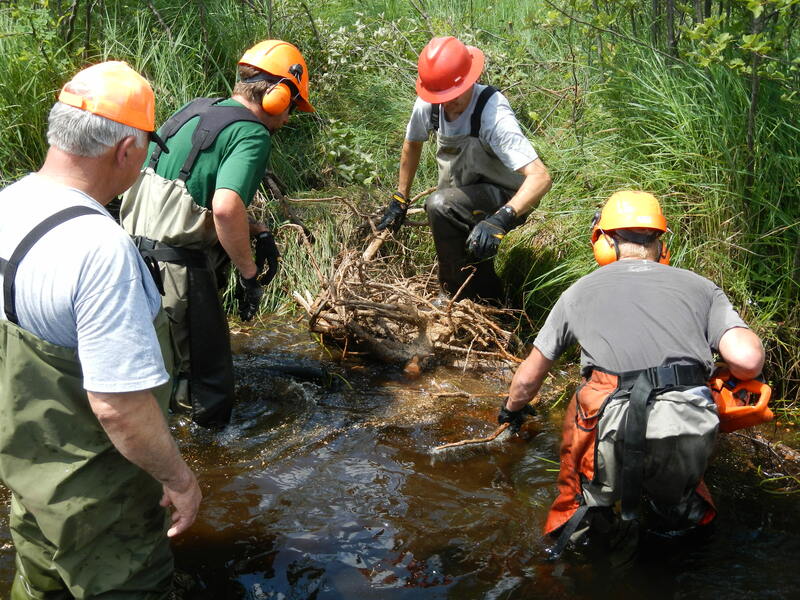 Collaborative stream work is undertaken throughout Oconto, Marinette, Forest and Langlade counties. 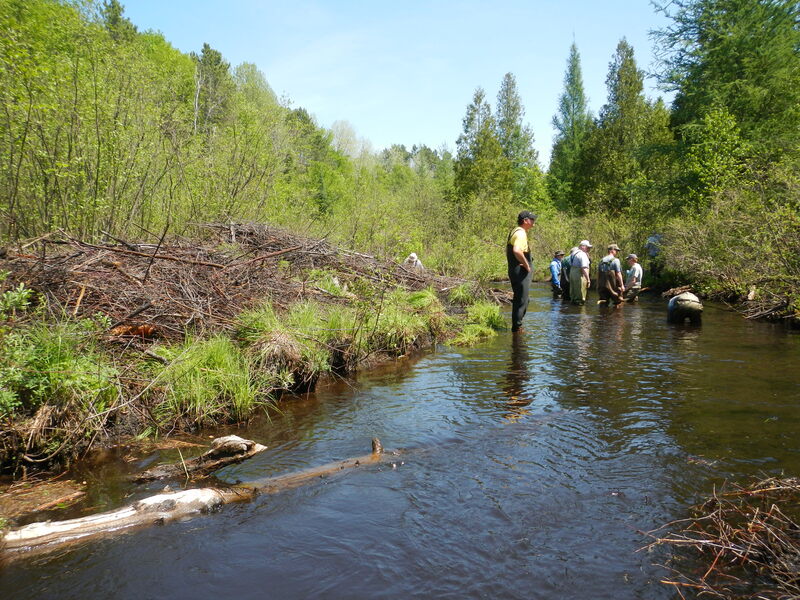 We work across the entire Oconto River watershed including the numerous north and south branches to benefit brook and brown trout and also the lower river below the Stiles dam. 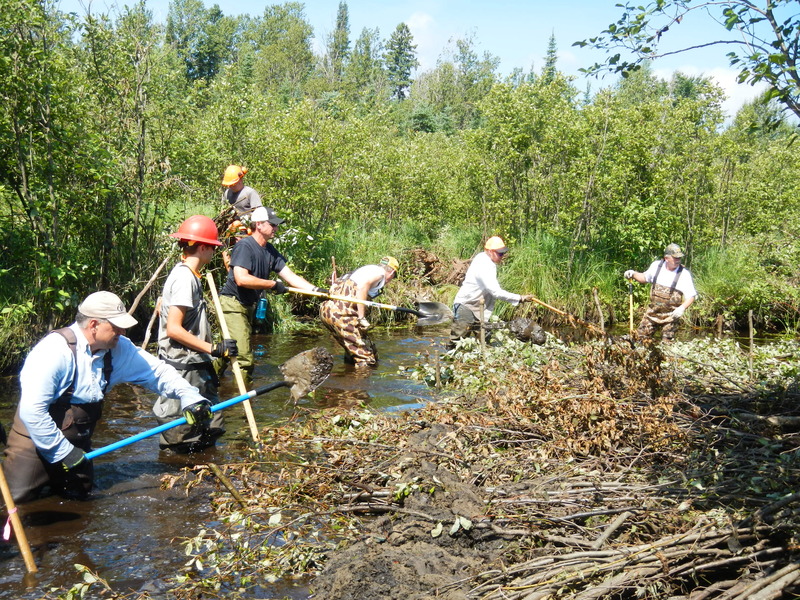 On the upper river: brush bundles, tag alder removal, large log structures, debris and beaver dam removal are performed on a regular basis. 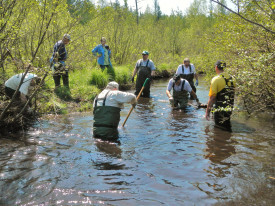 McCaslin Brook has been a focus of the chapter to benefit brook trout. 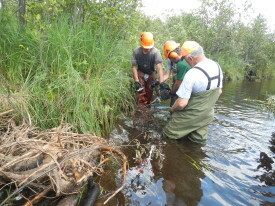 We perform brush bundle installation, channel dredging, debris and tag alder removal. 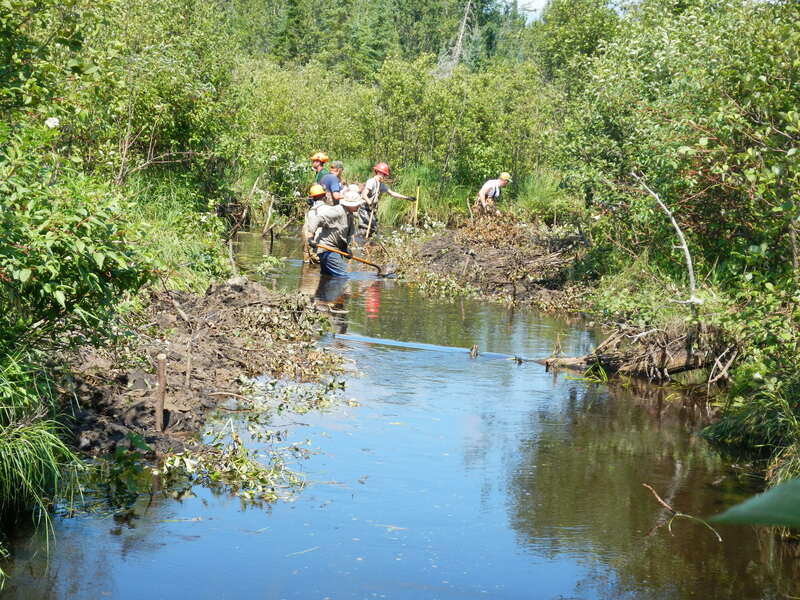 Our work on Beaver Creek continues from the 1970’s, when a major restoration project was undertaken. Recently, an improperly placed culvert was replaced allowing fish passage to miles of previously inaccessible upstream spawning areas. 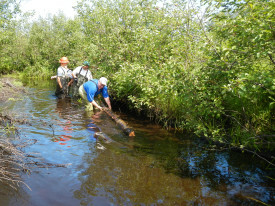 Within the past few years, rock placement and reinforcement of eight existing overhead boom structures was accomplished. 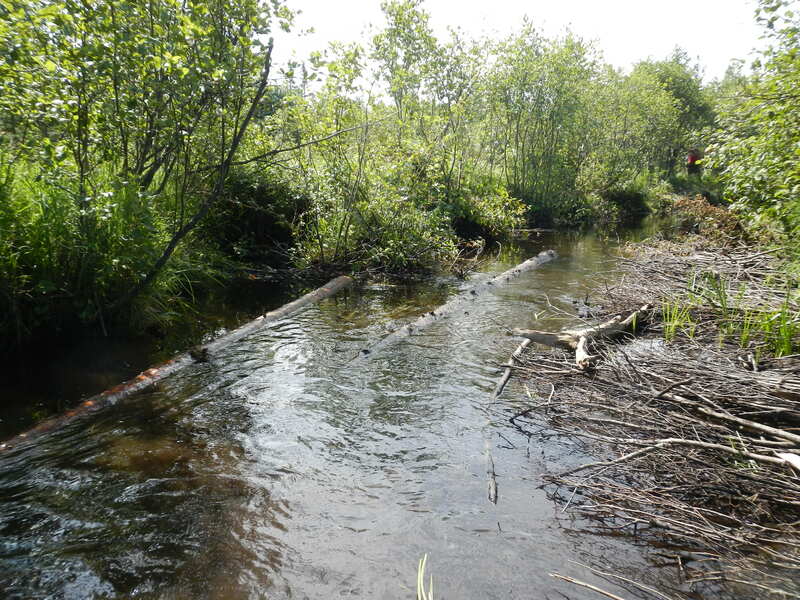 These structures provide deep undercut banks, an ideal trout habitat. 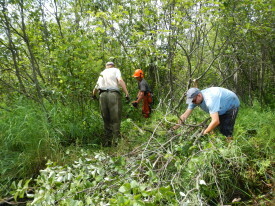 Brush bundles, tag alder removal, and rock placement are ongoing tasks. 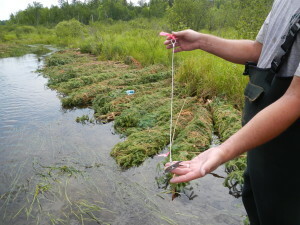 Stake lines are placed to guide bundle placement for stream contour. 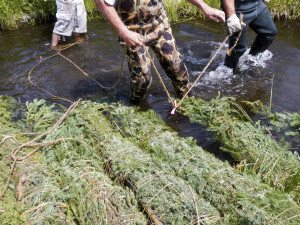 Conifers and/or tag alders are pulled together with rope, placed and anchored at the edges of streams. 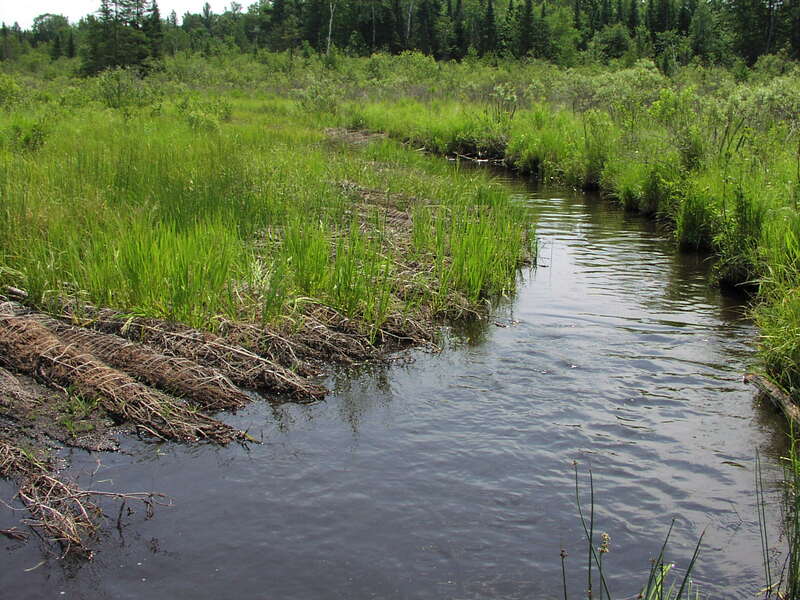 Proper placement narrows and deepens the channel, provides undercut banks, restores the natural meander of the stream, and the thalweg (the central current) is enhanced. 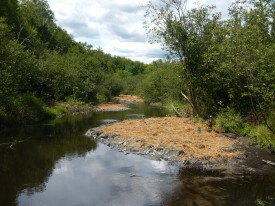 Stream sediment is continually captured by the bundles allowing banks to form and grasses to establish. 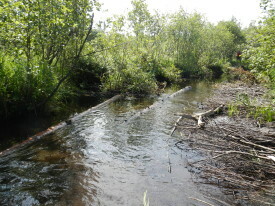 Large logs are anchored in various stream positions depending on the desired effect: along side the bank, mid stream parallel to currents, and from the bank extending across current. Proper placement provides overhead safety cover, diverts water flow, scours the stream bottom, and cuts the channel for best flow and trout holding depth. 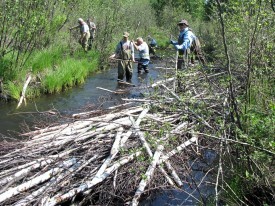 Proper flow and wood cover is ideal trout habitat. Tag alders are cut from along the stream edges and frequently re-used for bundling placement. 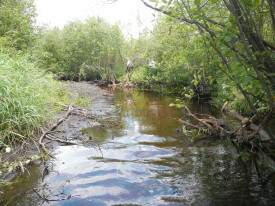 Tag alder removal allows: sunlight to enter the stream, proper water low, and meadow re-growth along the banks. 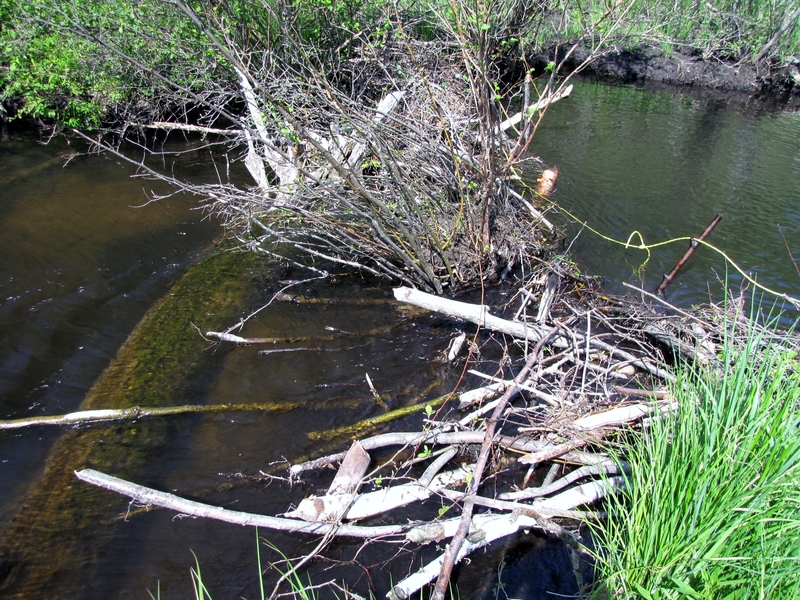 In-stream debris interfering with proper stream flow is removed or placed in a different area. 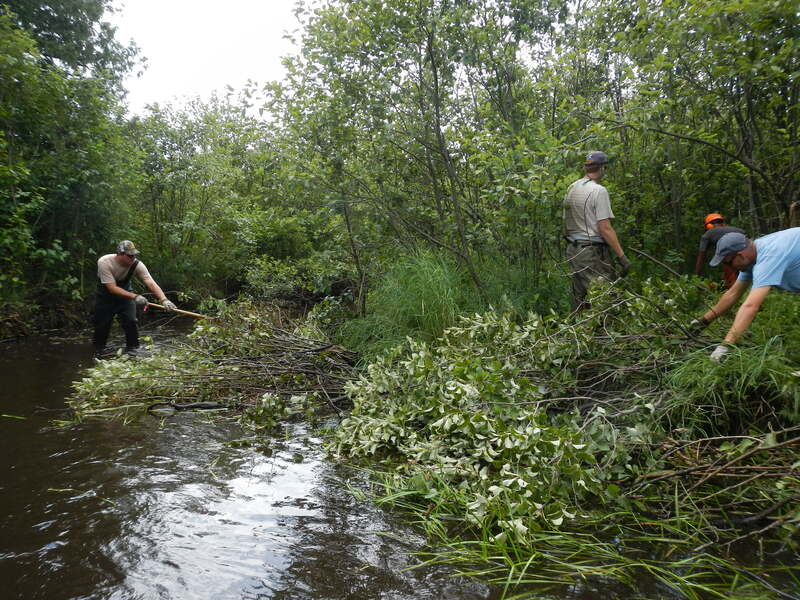 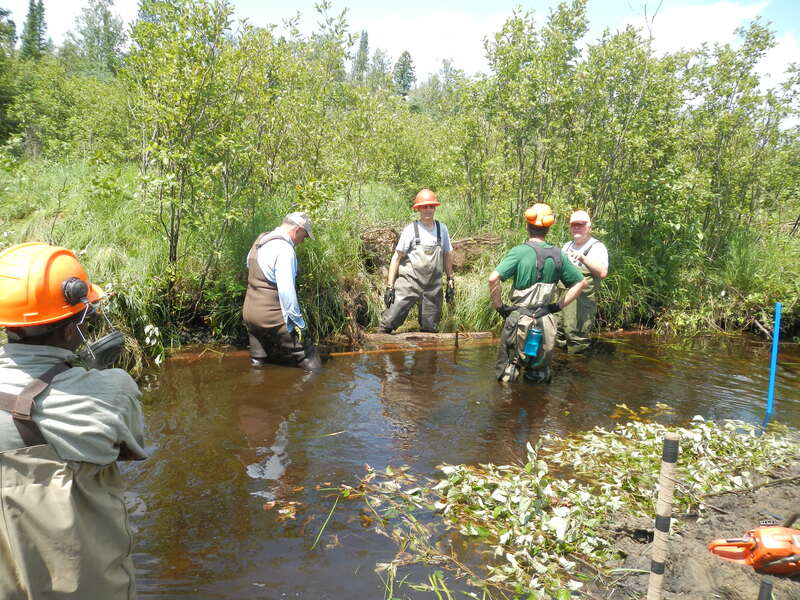 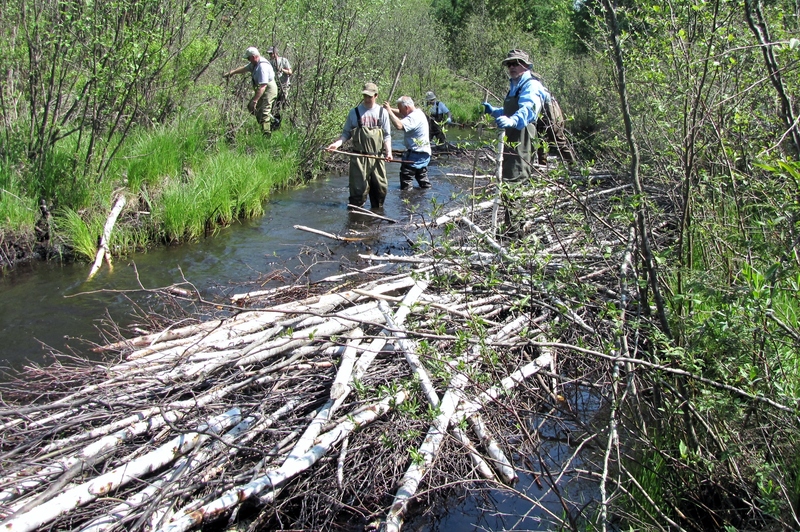 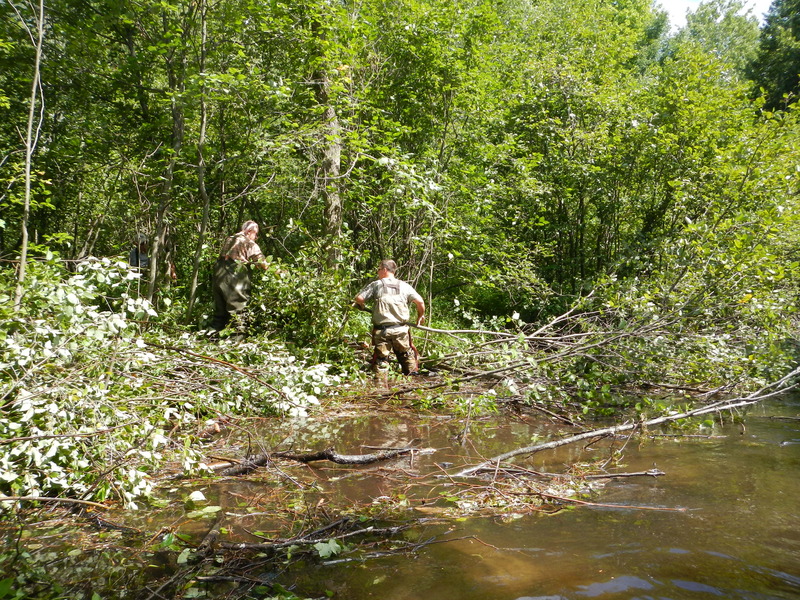 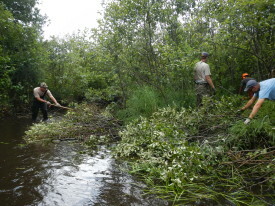 Removal assists in clearing trout gravel spawning areas, with increased stream depth and flow. 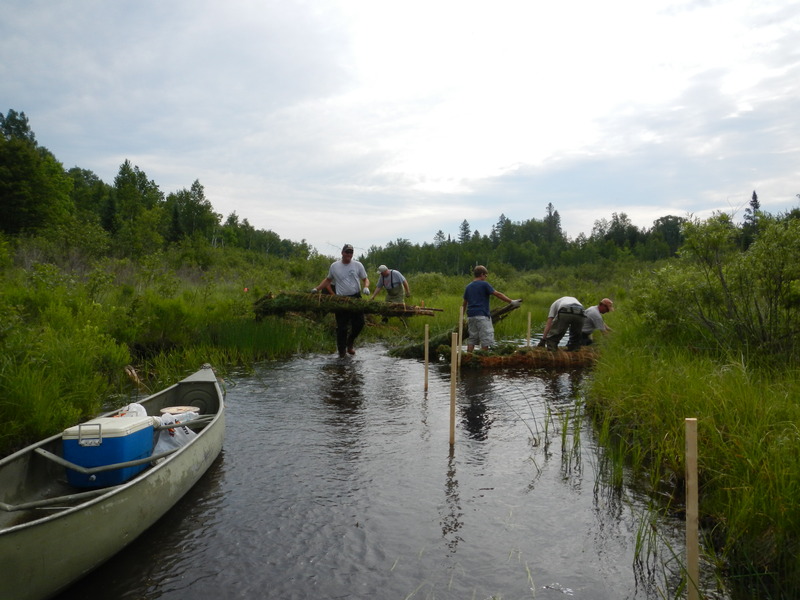 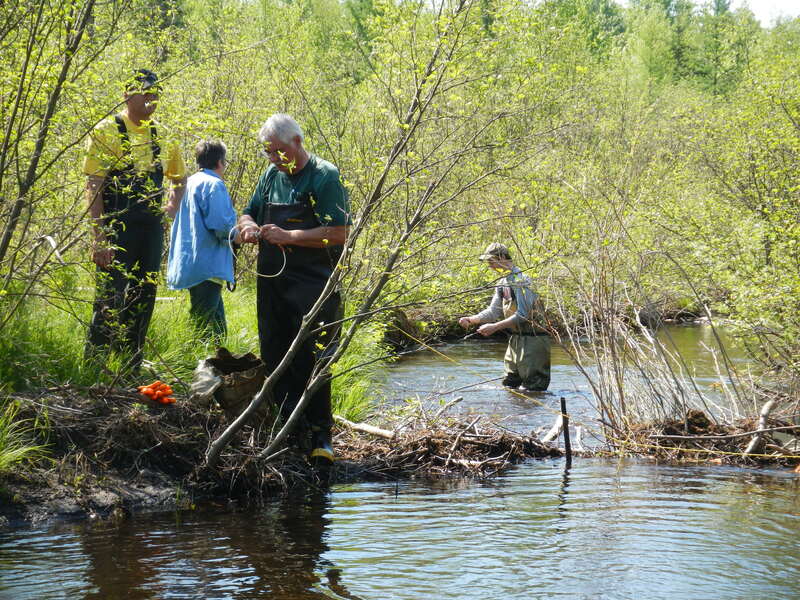 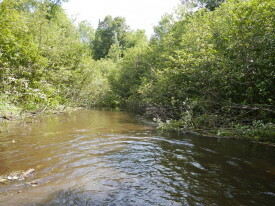 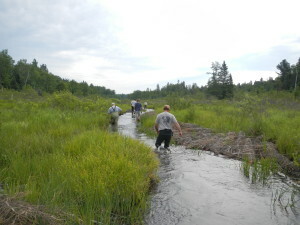 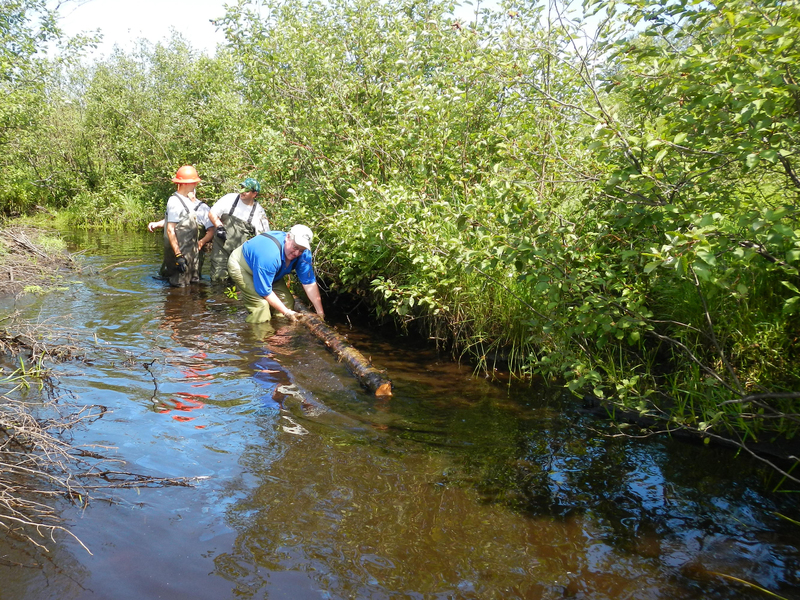 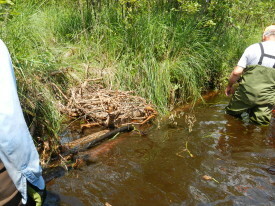 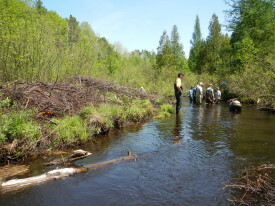 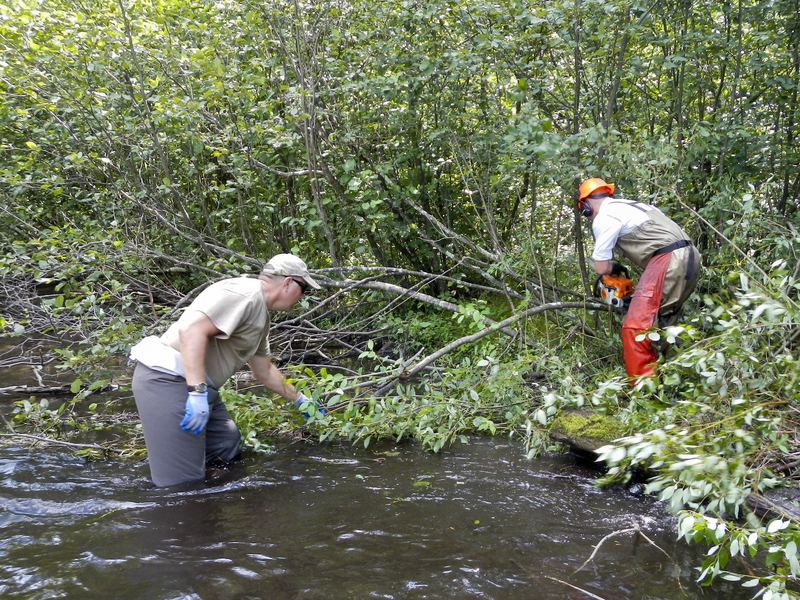 The pictures below illustrate tag alder removal on the Oconto & Evergreen rivers. 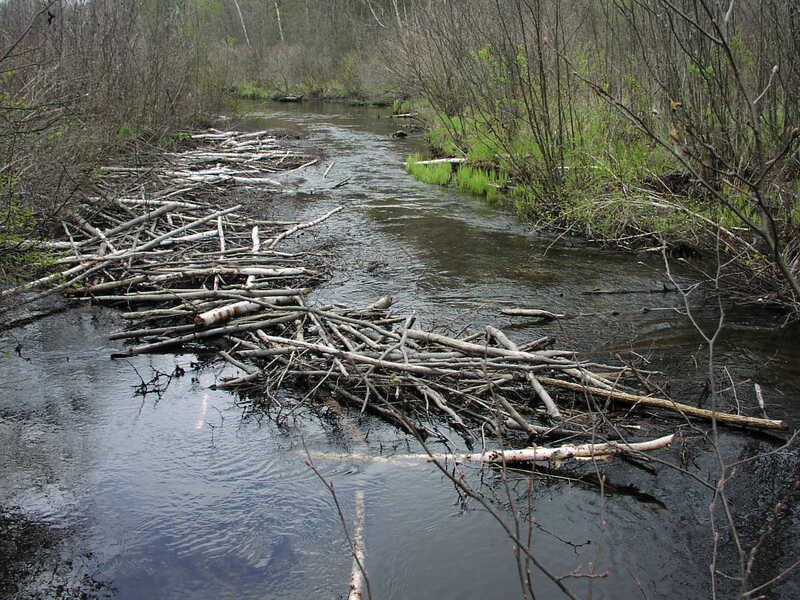 Initially, beaver dams can provide large holding pools for trout, however, over time the structures cause: increased water temperatures by slowing steam flow, siltation of gravel, degrading of banks, and barriers to fish migration. 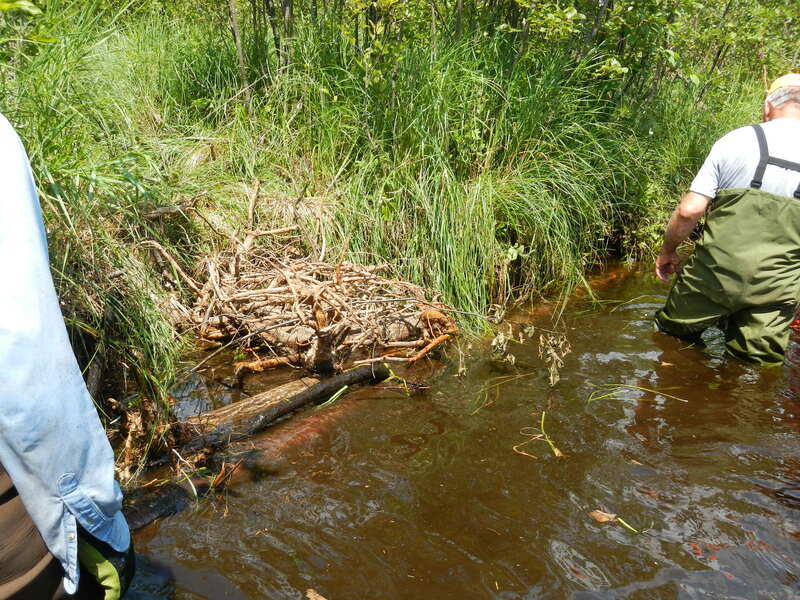 The process begins by trapping and removing beavers from areas of infestation. Dam and food cache removal restores trout habitat throughout the area by permitting the stream to have proper flow. 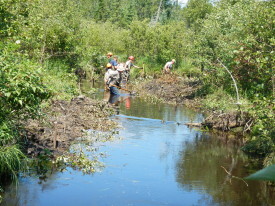 Large dam removal usually requires extensive bank restoration. 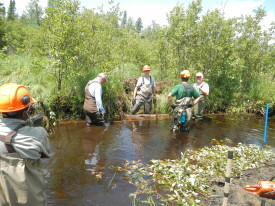 Sediment is removed from the steam bottom to expose gravel and increase depth and flow. 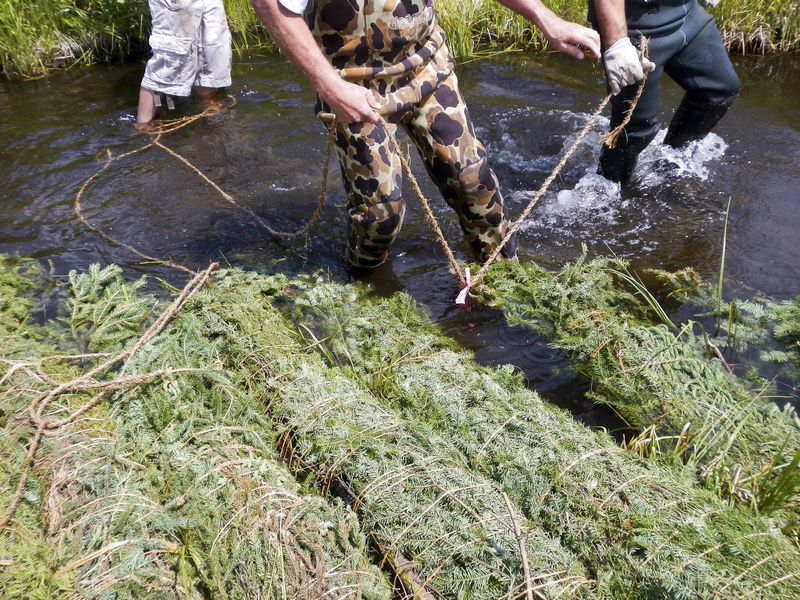 When used in conjunction with brush bundles, the sediment is placed on top on the bundles for faster establishment of grasses. 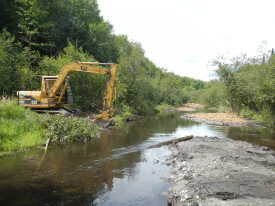 Heavy equipment is utilized when permitted and the dredging’s are placed to restore proper stream meander.